NewscastStudio recently talked with Dan Devlin, owner/chief creative strategist of Devlin Design Group, about the companies work at WAGA-TV. WAGA-TV was really impressed with the set we had recently completed at their sister station KSAZ-TV in Phoenix. There was a good amount of buzz within the FOX O&Os about the design at KSAZ-TV, which recently won the PromaxBDA Gold award for scenic design. Jeff Zellmer, WAGA-TV’s, creative services director, reached out to us, and after several phone chats we decided to set up an on-site visit to meet with the rest of the team and explore the possibility of working together. What were the client’s specifications and needs? 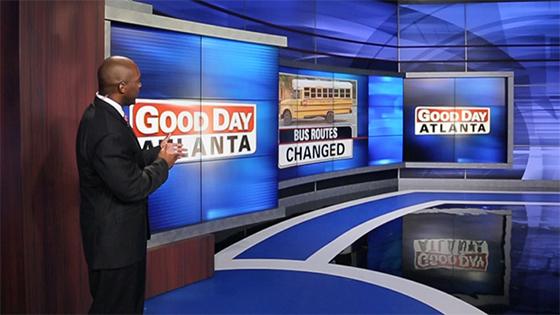 FOX 5 Atlanta’s desires for fast paced, interactive, true storytelling production values were being inhibited by the current set design. They wanted a set that could take viewers deeper into the stories by improving their storytelling capabilities. The multiple HD video walls have the ability to display limitless video and graphical content. This allows the talent to stop and use specific content changes in the video walls to visually punctuate their story. The storytelling wall and the other innovations on this set are truly redefining the scenic world. You will be able to see proof of this statement in about a year … when Team DDG won’t be the only ones providing versions of this original design element. But that’s OK, because by then, we will have already created the next leading edge new thing! How does this set evolve from the set it’s replacing? The previous design was restrictive to more contemporary talent, camera movement and in-depth story telling requirements. The old design served the station well for a number of years, but the local TV news production model has changed dramatically, and a new storytelling environment was badly needed. You called this a ‘redefining moment,’ how so? Innovation is one of our foundational elements at Team DDG. So, it’s important that each of our original designs not only inspires viewers but are truly innovative. For the past couple of years, our designs have grown beyond static backgrounds and have actually become key impact storytellers for news departments across the globe. 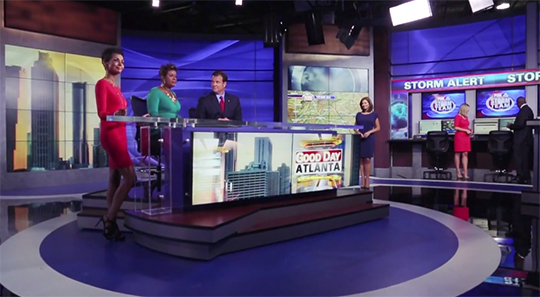 That is exactly what happened when we sat down with the folks at FOX 5 Atlanta and brainstormed the creation of this storytelling environment. We listened carefully to their vision and what they wanted from their new set. One of the key innovations we developed that day was the concept of the storytelling wall. Imagine a piece of the HD video wall positioning itself at a 90-degree angle away from the main wall to allow the reporter or talent to set up his or her story. Once the setup is complete, the storytelling wall pivots back to its original position, allowing the talent to use it and the rest of the video wall as part of the continuing story. Essentially taking viewers deeper into the story from a visual perspective. We’ve been executing these large monitor configurations and LED backlit scenic walls for a good deal of time now, so because of the knowledge we’ve gained we know what to expect and their optimal performance range. Coupled with 3D models, camera testing of finishes and full pre-assembly in our scene shop, it’s fair to say that we can exceed the client’s expectations every time. After the conceptual sketch phase, we create our designs in AutoCAD, and we use 3DS Max with various plugins for our 3D renderings. The storytelling wall’s motorized mechanics were built from scratch in our shop. Very strong. 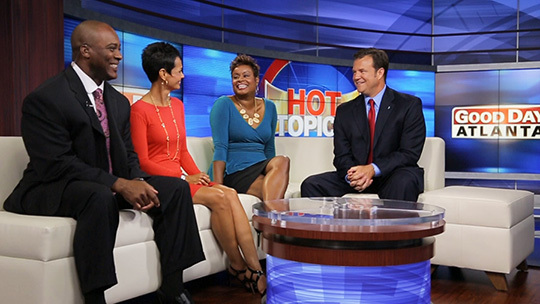 The station reports getting rave reviews from both viewers and friends alike. But in addition to that, we’re seeing something very interesting happening inside the building … and we’ve seen it before. The storytelling environments being designed by Team DDG are visually stunning for the audience, but they also appear to be energizing the news staff as well. We saw it at KSAZ-TV in Phoenix, and it’s happening at WAGA-TV as well. The set provides a wide array of storytelling choices…and producers are excited and eager to take full advantage of its near limitless visual opportunities. The talent is also being energized by the movement and HD backgrounds included in this new interactive set. Bottom line is a dazzling and original design that challenges producers, energizes talent and inspires viewers.